A hernia is defined as the protrusion of a whole or part of an organ through the wall of the cavity that contains it into an abnormal position. A hiatus hernia describes the protrusion of an organ from the abdominal cavity into the thorax through the oesophageal hiatus. This is typically the stomach herniating although rarely small bowel, colon, or mesentery can also herniate through*. Hiatus hernia are extremely common, however the exact prevalence in the general population is difficult to accurately state, simply because the majority are completely asymptomatic. However it is estimated that around a third of individuals over the age of 50 have a hiatus hernia. 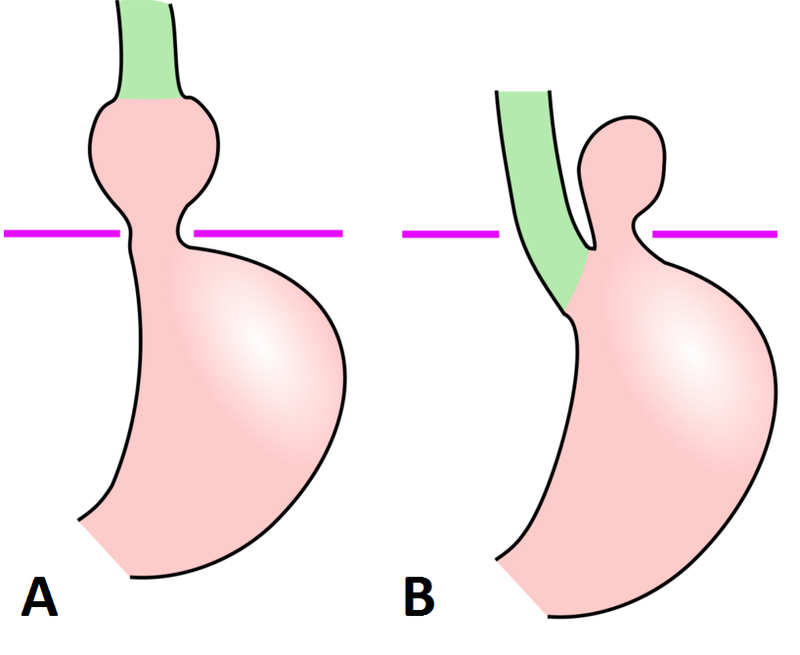 Sliding hiatus hernia (80%)– the gastro-oesophageal junction (GOJ), the abdominal part of the oesophagus, and frequently the cardia of the stomach move or ‘slides’ upwards through the diaphragmatic hiatus into the thorax. Rolling or Para-Oesophageal hernia (20%) – an upward movement of the gastric fundus occurs to lie alongside a normally positioned GOJ, which creates a ‘bubble’ of stomach in the thorax. This is a true hernia with a peritoneal sac. The proportion of the stomach that herniates is variable and may increase with time, eventually may evolve to have almost the entire stomach sitting in the thorax. *A mixed type hiatus hernia can also occur, which has both a rolling and sliding component. Age is the biggest risk factor for developing a hiatus hernia, due to a combination of age-related loss of diaphragmatic tone, increasing intrabdominal pressures (e.g. repetitive coughing), and an increased size of diaphragmatic hiatus. Pregnancy, obesity, and ascites are also risk factors, due to increased intra-abdominal pressure and superior displacement of the viscera. The vast majority of hiatus herniae are completely asymptomatic. Patients may experience gastroesophageal reflux symptoms, such as burning epigastric pain, which is made worse by lying flat. In patients with a hiatus hernia, these symptoms are often more severe and treatment-resistant. Other signs and symptoms that can occur include vomiting and weight loss (a rare but serious presentation*), bleeding and / or anaemia (secondary to oesophageal ulceration), hiccups or palpitations (if the hiatus hernia is of sufficient size, it may cause irritation to either the diaphragm or the pericardial sac), or swallowing difficulties (either oesophageal stricture formation or rarely incarceration of the hernia). The clinical examination is typically normal. In patients with a sufficiently large hiatus hernia, bowel sounds may be auscultated within the chest. Particularly if there is evidence of gastric outlet obstruction, early satiety, or weight loss. 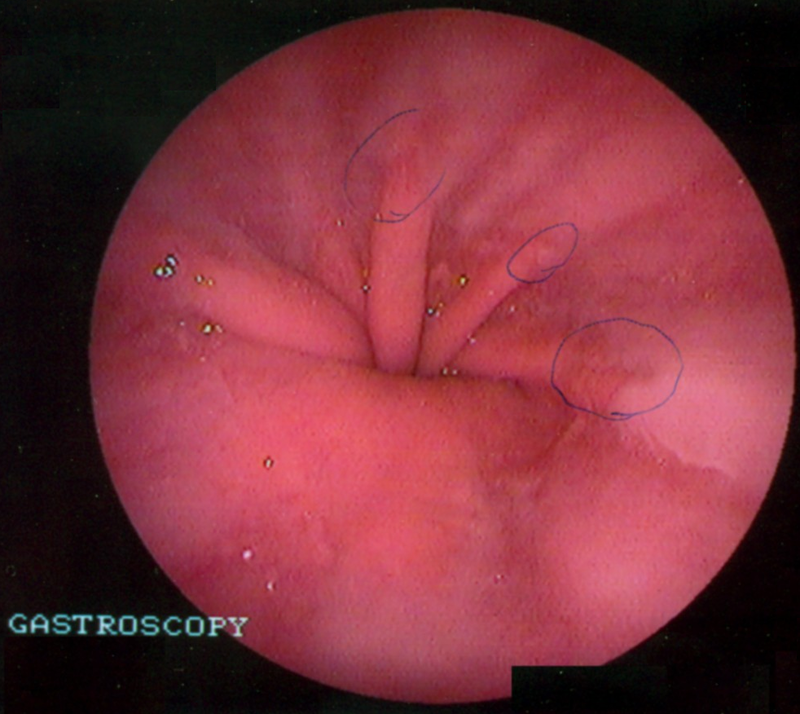 Oesophagogastroduodenoscopy (OGD) is the gold standard investigation (Fig. 3), showing upward displacement of the Gastro-Oesophageal Junction (GOJ, also termed the ‘Z-line’). *If there are symptoms of gastric outflow obstruction or weight loss, whereby an upper GI malignancy may be suspected, an urgent CT thorax and abdomen is mandatory. The first line pharmacological management for a symptomatic hiatus hernia is a Proton Pump Inhibitor (PPIs), such as omeprazole, acting to reduce gastric acid secretion and aiding in symptom control. PPIs must be taken in the morning before food, otherwise the drugs’ binding site becomes internalised and are ineffective. Any patient should be advised of lifestyle modification, including weight loss, alteration of diet (low fat, earlier meals, smaller portions), and potentially sleeping with increased numbers of pillows. Smoking cessation and reduction in alcohol intake should be advised, as both nicotine and alcohol are thought to inhibit lower oesophageal sphincter function, thereby worsening symptoms. *Any patients presenting with suspected cases of obstruction, strangulation or stomach volvulus should have their stomach decompressed via a NG tube prior to surgical intervention. Cruroplasty – The hernia is reduced from the thorax into the abdomen and the hiatus reapproximated to the appropriate size. Any large defects usually require mesh to strengthen the repair. Dysphagia may occur if the fundoplication is too tight or if the crural repair is too narrow – this is relatively common early after surgery due to oedema. It settles to a variable degree in the majority of patients but in some may need revisional surgery. Fundal necrosis, if the blood supply via the left gastric artery and short gastric vessels has been disrupted. Hiatus hernias, especially the rolling type, are prone to incarceration and strangulation, like any other type of hernia. A gastric volvulus can also occur whereby the stomach twists on itself by 180 degrees, leading to obstruction of the gastric passage and tissue necrosis, and requires prompt surgical intervention. Which of the following is a known risk factor for developing a hiatus hernia? What branch of the aorta supplies the majority of the stomach? What is the gold standard investigation to diagnose a hiatus hernia? A patient with a known large hiatus hernia is admitted with severe epigastric pain and retching without being able to vomit. Their lactate is 6.2. What diagnosis relating to the hernia should you be concerned about?